Making yogurt has never been simpler, now that I am using my Instant Pot pressure cooker to make it. You have so many choices when making yogurt: what milk to use, type of starter, how long to incubate, how thick, and how sweet. So many options! Goat milk is a good option for those who have a dairy allergy, as it is easier to digest, is naturally homogenized, has less lactose, and has 89% less of the alpha S1 casein, which is common in cow's milk and more likely to cause a dairy allergic reaction in some individuals. The fermentation process breaks down the proteins in the milk for better digestion. You can find out more about Goat vs Cow milk for making yogurt here. Milk: The fresher the milk, the less "goaty"it will taste. Goat milk has a stronger taste than cow's milk. 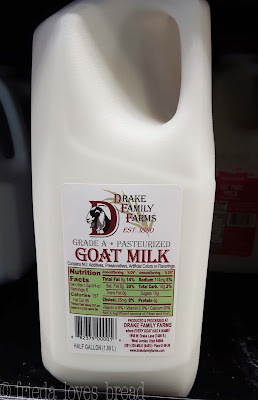 I am using pasteurized goat's milk from the Drake Family Farm. 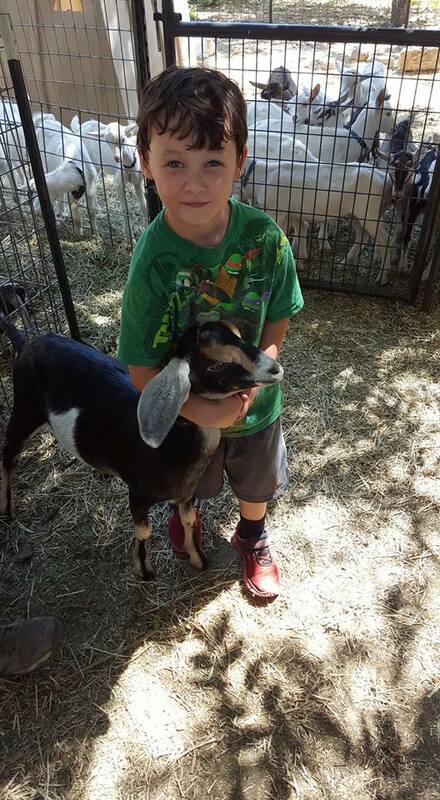 My grandson got to visit this farm, adopt a goat and give it a name. So fun! 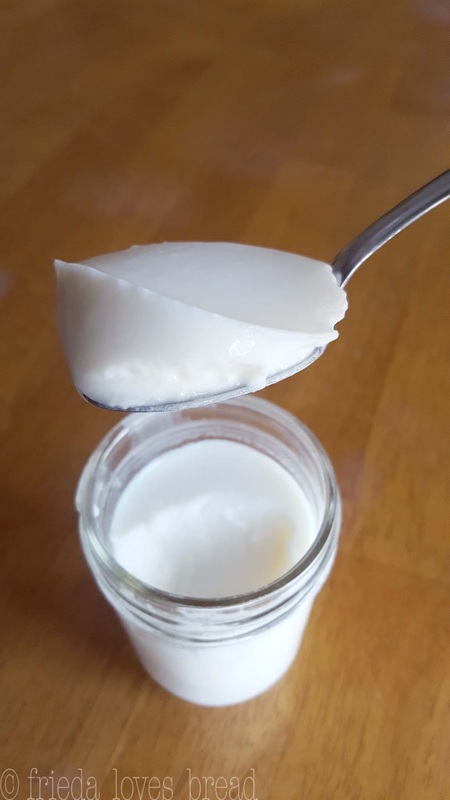 Starter: You can use a plain, unflavored dairy yogurt for your starter (that contains Live/Active cultures) all you need it 1-2 tablespoons. The small amount shouldn't affect any dairy allergies, but if you are concerned, you can use a non dairy yogurt, such as SoDelicious, as your starter. You can also use a powdered direct starter, such as Yogurmet, that can be found online or at health food stores. 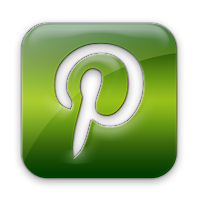 You can read more about yogurt starters here , how to choose them and where to find them. Heating the Milk: You will need to heat your milk to at least 100°-110° for the yogurt cultures to work. While researching, I found that the higher you heat your goat milk yogurt, the more "cooked" it will taste. 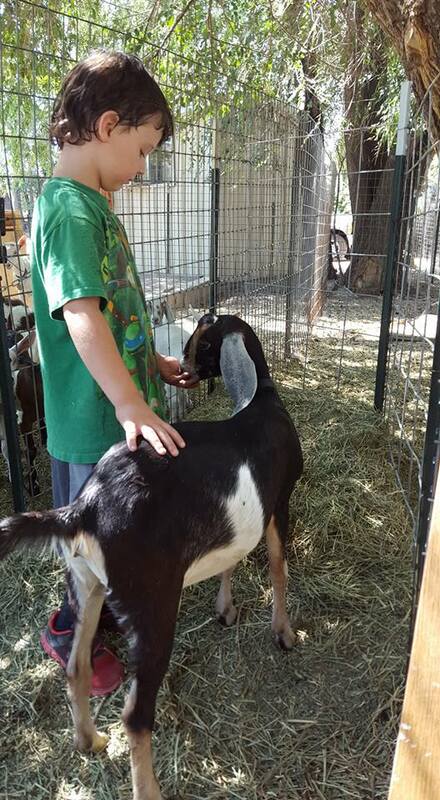 Brod & Taylor found that keeping the goat milk under 165°F gave a fresher taste to their yogurt, so that is the temp that I used. Thickeners: Because of the different structure of the proteins in goat's milk, it makes a thin, pourable yogurt. If you want it to be thicker, you will need to add a thickener. Brod & Taylor suggest using cornstarch or agar agar powder, dissolving it into a little bit of cold milk and adding it to the hot milk. You can view a list of suggested thickeners, how to use them, and the pros/cons of each here, at Cultures for Health. 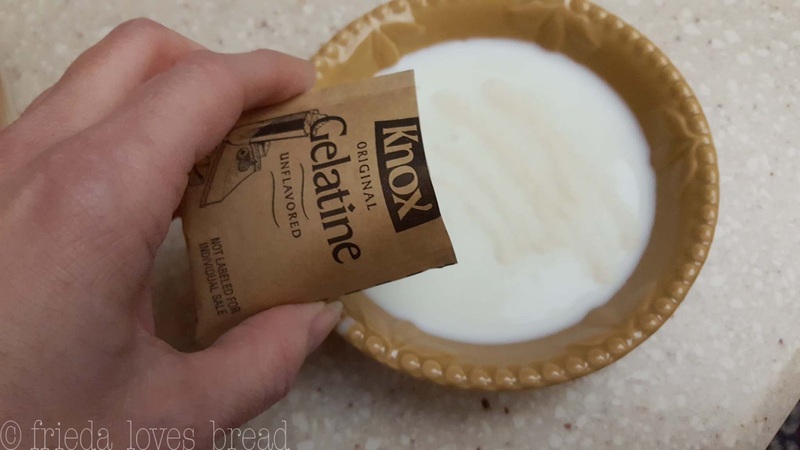 So, I ended up using Knoxx unflavored gelatin as my thickener, which worked much better! 1T. of powdered gelatin per 4 cups is all you need. It's important to sprinkle the gelatin into cold milk to let it soften, and then add it to hot milk to dissolve it. If you add the gelatin to cold or warm milk, you will have little bits of gelatin floating throughout your yogurt. Are you ready? Let's make yogurt! 1. Clean, Cold Pot: Start with a very clean pot, free of any soap residue. No need to sanitize or sterilize the pot. 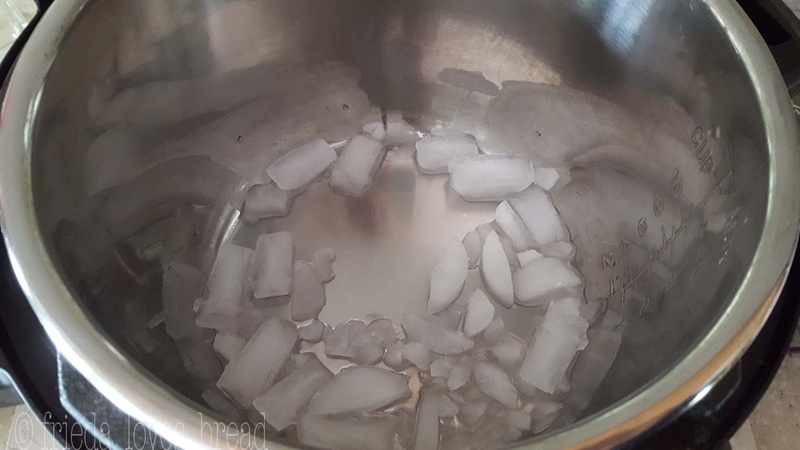 Add some ice cubes to your Instant Pot liner. Let it sit for a couple of minutes, then pour the ice water out. Do not wipe dry. 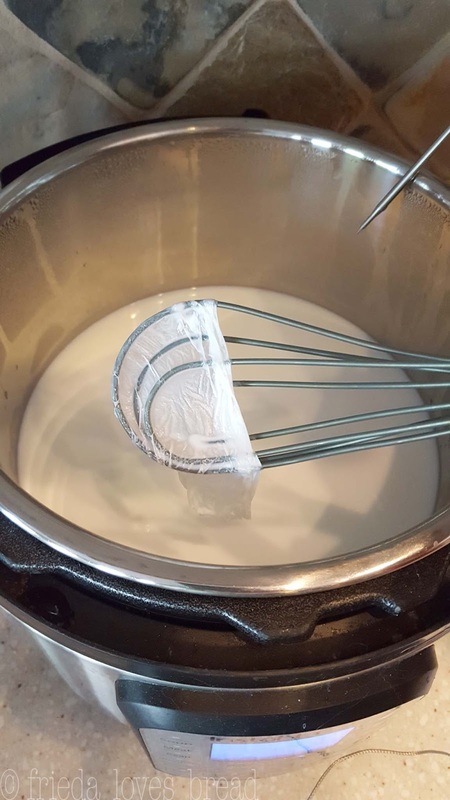 This will help keep the milk from sticking to the bottom of your pot, making it easier to clean. 2. Milk: Pour the milk directly into the chilled pot liner. 3. 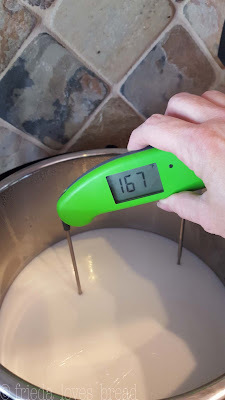 Heat Milk: Since the Instant Pot heats milk in the 160°-180°F range, I opted to use a probe thermometer to make sure the milk didn't get above 165°F. If you don't want your milk to go over 165°, you can check the temp mid-cycle at 15 minutes, and test the temp with your thermometer. You can use the complete yogurt cycle and reach a higher temp, if you wish - the yogurt will have a more "cooked" taste. When the boil cycle has ended, the IP will beep 3 times and display YOGT. When the boil cycle has ended, the display will show YOGT. 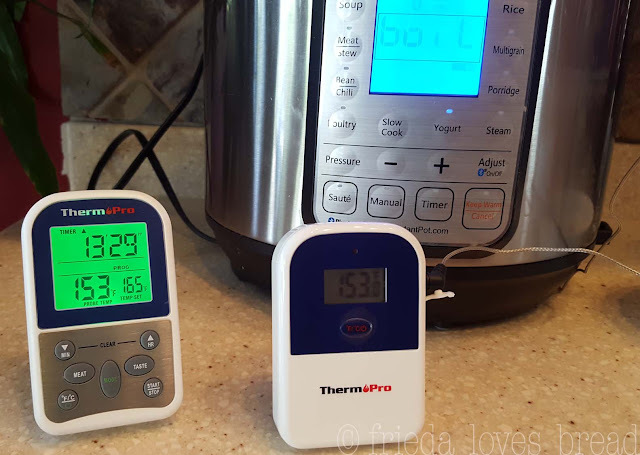 This ThermPro remote thermometer is pretty easy to use, and is relatively inexpensive. The unit on the left is portable and flashes green while the milk is getting to temperature. The unit on the right is connected to the probe, which is in the milk. You don't need to use the IP lid for making yogurt. You can use any lid from your pots/pans, a glass lid, a dinner plate, glass pie plate, or a flat silicone suction lid. 4. Bloom Starter & Check Temp: While your milk is heating, sprinkle your unflavored gelatin into some cold milk. The ThermPro flashes red and beeps when the temperature is reached. I tested the milk temp with my highly accurate Thermapen, and it read 2 degrees warmer. I may need to calibrate my ThermPro thermometer and adjust it for more accuracy. 5. 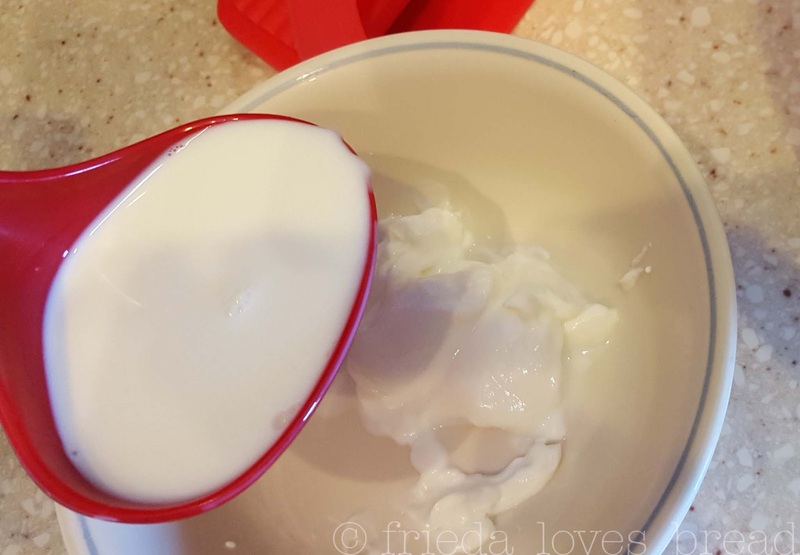 Remove the skin from the surface of the milk. This will help your yogurt stay smooth and creamy. 6. Stir in Gelatin: Mix the bloomed/softened gelatin into the hot milk. Whisk well. 7. 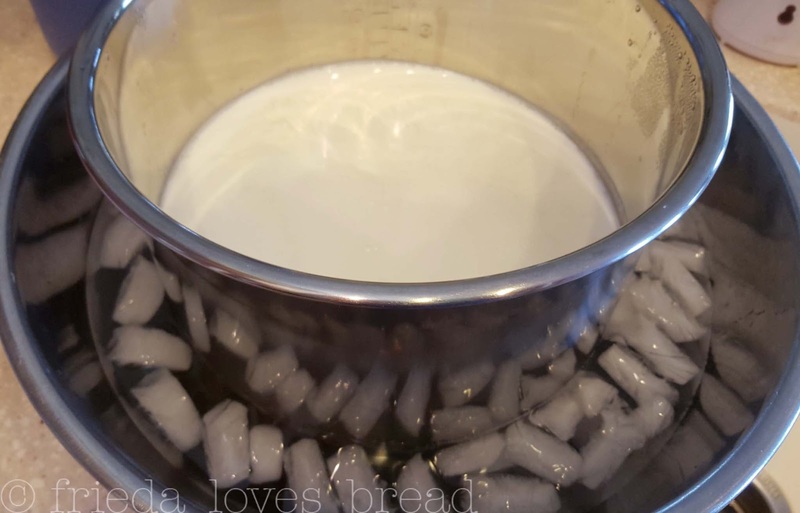 Cool the Milk & Check Temp: Place the bowl into another bowl of ice water to help cool the milk to 100°F-110°F, whisking while taking the temp. It should less than 5 min. You will want to shoot for this range to add your starter, as it is the optimal temp zone for it to culture properly. Any higher temps will kill your starter and result in a thin milk, not yogurt. Wipe the outside of the bowl dry before placing it back into the IP. 8. Temper Starter: Take a cup of your cooled milk and whisk in your starter, dissolving it well. Pour this mixture into your milk and give it a good stir. Tempering brings your starter to the temperature of your cooled milk and helps dissolve it better. 9. Incubate: This means to keep the milk and yogurt cultures at a constant 100°-110° temp for several hours. Incubate on Yogurt Normal for at least 6-8 hours for a mild yogurt, 9-10 hours for more tang. DUO & SMART Models: Push Yogurt once. It will say 8:00 & Normal. If not, keep pushing the adjust button until it displays 8:00 and Normal is lit. 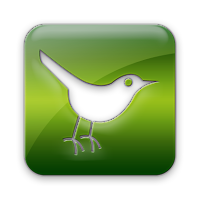 Press +/- to set incubation time. When finished, the IP will beep and display YOGT. When the yogurt cycle has ended, the IP will beep and display YOGT. 10. Add your flavoring: Your yogurt will look thin. No worries! Putting your yogurt into the fridge will activate the gelatin and help it set and firm up. Add your vanilla and choice of sweetener at this time, if desired. I like to use 1 teaspoon of vanilla extract and 2-4 tablespoons of warmed honey or granulated sugar. Mix in well. Pour your yogurt into individual jars. Glass or plastic canning jars work well. Allow your yogurt to chill in the fridge for at least 4-6 hours, or until the gelatin has set. Goat milk yogurt has different milk proteins than cow's milk and needs a thickening agent to help it set like a traditional yogurt. Using the correct amount of gelatin helps keep the right consistency. 1. Start with a very clean pot and utensils. Put several ice cubes into the pot. After a few minutes, pour out the ice water; do not wipe the pot dry. 2. 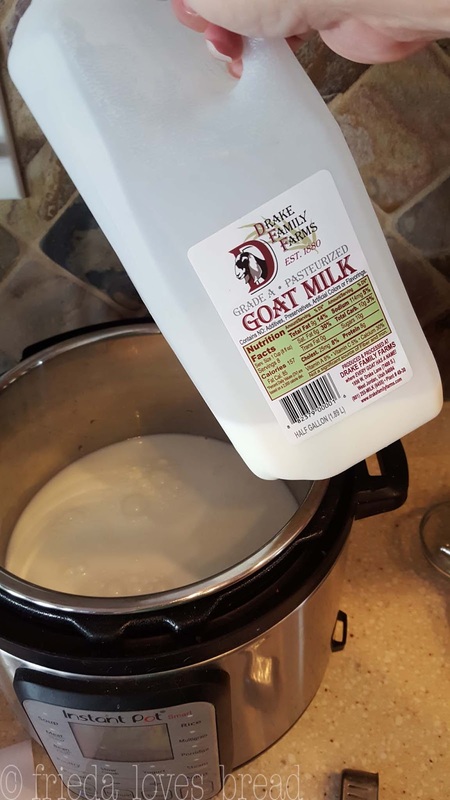 Pour your 7 cups of goat milk into the pot. Reserve the extra cup of milk for step 4.3. Heat your milk by using the BOIL cycle as directed by your Instant Pot model, to your desired temperature. 165°F is recommended for a clean taste. 180°F will give you a more 'cooked' taste. Check mid-cycle at the 15 minute are and test your temperature with an accurate thermometer.4. While your milk is heating, sprinkle 2 Tablespoons (one package) of unflavored gelatin into the cold, reserved milk. Allow it to sit and soften (bloom) for at least 10 minutes.5. After your milk has heated to your desired temperature, whisk your bloomed gelatin into the hot milk. Mix well.6. Cool your milk to 100°-110°F by setting your pot of hot milk over a large bowl of ice water or sink filled with cold water. Whisk and take the temperature every couple of minutes. It should take less than 5 minutes.7. When you have reached your cool down temperature, take a cup of your cooled milk and stir in your 2 Tablespoons of yogurt starter or powdered starter, and mix well. Pour this mixture into your pot of cooled milk and stir well to combine.8. 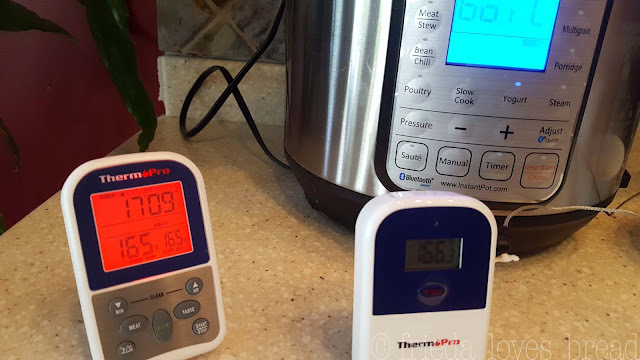 Incubate your yogurt by setting your Instant Pot on the Yogurt Normal cycle (based on your model), which defaults to 8 hours. Push the +/- buttons to increase or decrease the incubation time. 9. When the cycle is complete, your Instant Pot will beep and display YOGT. 10. Flavor your yogurt with 1 teaspoon of vanilla extract and your choice of sweetener to taste. 2-4 Tablespoons of warmed honey or granulated sugar works well. Mix well.11. Put yogurt into a container or individual containers with a well fitting lid and place in the refrigerator for 4-6 hours. Yogurt will look thin, but set up once chilled. *You can cut this recipe in half, using 4 cups of milk, 1 Tablespoons of yogurt starter and 1 Tablespoon of unflavored gelatin. Keep the same incubation times.